1,20 mm latex. 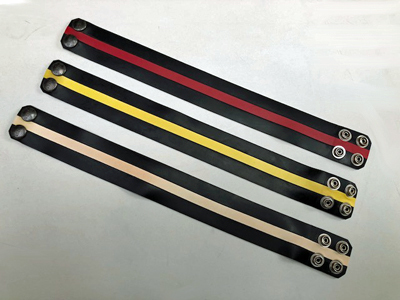 Plain black rubber bicep strap with colored stripe. Each size is adjustable with two snap fastners. Available in 4 colors, red, white, yellow or blue. Size S for biceps circumferences from 30 to 32 cm. Size M for biceps circumferences from 32 to 34 cm. Size L for biceps circumferences from 34 to 36 cm. Size XL for biceps circumferences from 36 to 38 cm.